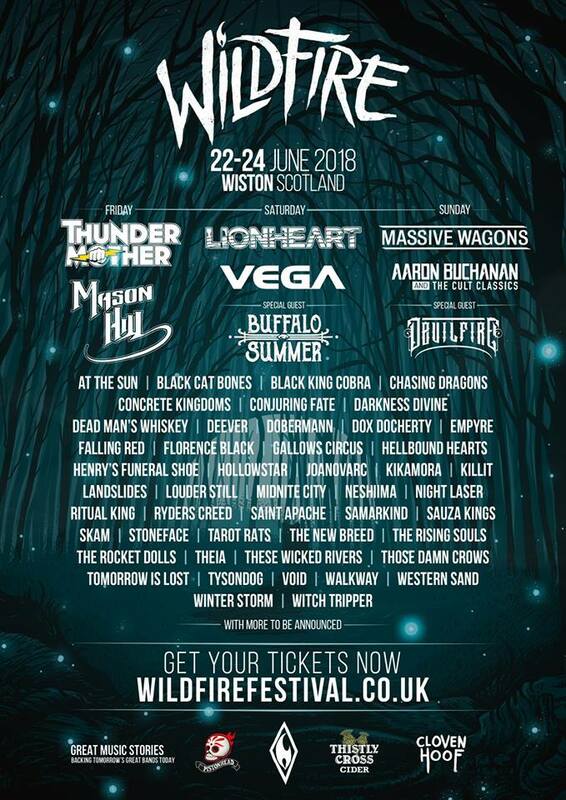 Much like we endeavour every year before Bloodstock, this year, for Scotland’s Wildfire Festival which kicks off on 22nd June, we’re interviewing every band set to play the stages of Wiston. You get to hear (or read) right from the horse’s mouth who you should be watching over the course of the weekend. Our thanks to all the bands for taking the time out to answer our questions! We are based in Hamburg, Germany. However, we are originally from Brunswick, a smaller city close to Hanover. Since Hamburg has one of the most active music scenes in Germany, it was a logical step to move our band there after we reached a certain level. We formed Night Laser in December 2013, even though we had been playing together for a couple of years before that. That was with a slightly different line up, though, and with another name. We used to go by the name Nightlife. As we released our first album, we decided that we needed a name more recognizable and exotic. Since we liked the N-L combination and wanted to keep the word “Night”, there were only so many words left to choose from, out of which “Laser” was by far the coolest! Our line-up is pretty basic; with one guitar, drums, bass and lead vocals (and 2 backings). So, we have a very transparent sound, very classy and still heavy and pushing. Our sound gives every band member the freedom to give 100% at every time, while maintaining the clarity to identify every instrument individually. This leads to lots of fun on stage and maybe even more fun in front of it. A uniqueness of our sound is the combination of sleazy, glammy hard rock riffs with the drive and energy of faster metal styles like heavy or power metal. However, there is also plenty of blues thrown in, and some songs even have an AOR vibe. What’s your live show like? Why should people watch you? We’re always giving 100%. There is constant action on the stage, with no space left unoccupied, and a great focus is put on interacting with the audience. We love what we are doing and always have a good time on stage which gets the crowd ecstatic as well. So, you can really expect one hell of a show! Have you played Wildfire before? If so, when? Not only is it our first time at Wildfire, but it’s also our first time in Scotland! So we are extremely excited to see how loud the audience can be. And, of course, we are eager to show you all what we are made of! What sort of setlist can we expect? It will be a nice journey through both our albums. There will be up-tempo smash hits as well as some more sensitive slow ones. Of course, our singles have to be in there as well! Which band are you most looking forward to seeing? We would love to see Vega, since we’ll play together with them, Crashdiet, Treat and The Poodles in September in Germany. But as we are only able to get to the festival on Sunday, we’re extremely hyped to see Massive Wagons. And, of course, our friends Kikamora with whom we’ll play in Stafford the night before. What have you got planned for the second half of 2018? We have plenty of shows planned, which will include club shows and open air festivals and even two really big shows that we are not allowed to talk about yet. As mentioned before, we will play with Crashdiet and The Poodles, and we will also do some touring in the European countries next to Germany. What’s been the highlight for the band’s career so far? We had the chance to support some nice bands like Rage, Bonfire and Alpha Tiger. But the greatest experience for us was to have Kai Hansen of Helloween sing with us on our current album Laserhead, and also at the release show for that very album. Another highlight would be the last UK tour that we did in 2017. We’re expecting no less of this year’s tour! Our singer Benno likes to climb. If there’s any kind of steel bar he’ll most likely try to get up there. However, once he almost fell off the stage. Our guitarist Hannes once got himself hilariously tangled up in a ventilator. And Rob our bassist once fell out of a second-floor window after a show. That’s a tough one. We are huge Black Sabbath fans, but that ship has sailed. Same goes for Twisted Sister, who would have been second choice. So most likely it would boil down to Manowar. To choose an opening act is just as hard. We have made a lot of good friends in the past, whom we’d love to share the stage with. Kikamora would be the first one to come to mind. But Cream Pie from Italy or our German partners in crime Snakebite are also great live bands and amazing to tour with! We’ll play on Sunday. However, we don’t know the exact time yet. Pistonhead Lager, Cloven Hoof rum or Thistly Cross cider? And yes, we’ll be counting the votes! Tough one! Altogether it would be Pistonhead! Germans love beer! But we’ll take the others just as well.